To hit your belly putter, you need to anchor the end of the shaft (grip) against your belly. The Advantage of a belly putter is that it eliminates any excess movement of your hands, wrists and arms during the putting stroke. 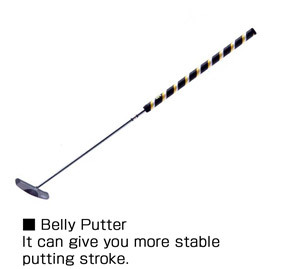 So if you need more stable putting stroke, a belly putter might help you achieve that. On the PGA Tour, there are lots of pros using the belly putter because it's so effective. If you feel like you need more confidence on the putting green, you should try a belly putter. Here are 5 important keys to hitting your belly putter. 1. Anchor the end of your shaft or grip against your belly. You can put it just above your navel or left of that spot. I would suggest you to put it little left of your navel or just above that spot. 2. Make sure to align your feet and shoulders parallel to the target line. 3. The ball position is important when hitting a belly putter. If you anchor your shaft in the middle of your stomach, position your ball in the middle of your stance. If you anchor your shaft little left of center, move your ball little left of center as well. 4. Position your hands little forward of your ball. If your hands are positioned in line with your ball, you will tend to pull the putt. So move your hands little forward of your ball to putt it straight. Because the shaft is anchored against your stomach, you will tend to hit up on the ball too much if the ball is positioned too far forward. So make sure to position your hands little forward of the ball. 5. Among the tour pros who use the belly putter, some players prefer to grip down on the putter when hitting a short putt. When hitting a long putt, you need a bigger stroke. So you want your hands higher on the shaft. But with a short putt, you don't need a bigger stroke. So with a short putt, you might want to grip down on the putter for more stable stroke. With a belly putter, you want to pay attention to the ball position and the hands positions. Especially with a belly putter, those are the important keys. The advantage of a belly putter is that it gives you more stable stroke. But this means that it could take away the feel. If you are feel putter, you may do better with a conventional type of a putter. But under the pressure, a belly putter should give you more stable putting stroke. I would recommend a belly putter for golfers who are fighting the yips, golfers with handsy putting stroke and golfers who are lacking confidence on the greens.